It's starting to be that time of year again. Ice season is over (mostly), and it's now time to start dodging powerful spring and summer thunderstorms. The Weather Channel warned me of the chance of severe storms from Texas all the way up towards Michigan, as I got ready in the hotel room. Some cold front pushing across the country, lifting the warm, unstable air ahead of it resulting in thunderstorms. Sounds like fun. Heading to KJAX, the storms are fighting to gain strength and form a huge line as we easily pass above and north of the weak cells. Well that was easy... I wonder what it will be like heading back tomorrow. 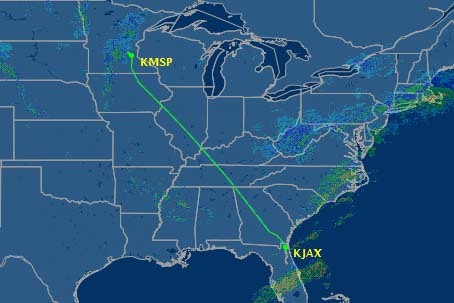 A typical flight between KMSP and KJAX... fairly direct. Dispatch has filed us to the west, then turning north towards MSP. I guess that's probably shorter than heading northeast first, then cutting across. We have a couple thousand more pounds of fuel than the normal route requires... hopefully that will be enough. Airborne: Our radar can only 'paint' thunderstorms a couple hundred miles away (still pretty impressive!) giving us a limited view of the overall picture. 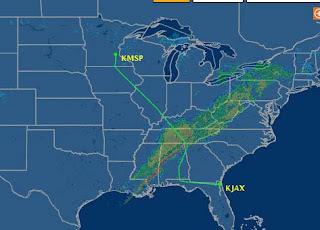 A quick call to ATC confirms our doubts: They suggest flying all the way to Alexandria, LA before hanging a 90 degree right turn and heading north to MSP. Ok... after entering it into the computer, it adds almost 300 miles to our flight. We'll be 45 minutes late, and landing with just a few hundred pounds above our minimum required landing fuel, IF we can even find a way through the line near Louisiana. No thanks..
Another call to ATC, and we get news that the tops are lower up near Nashville, and a few planes are picking their way through the line there. Ok, that sounds better.. change of plans, let's head towards Nashville and hope we can get through the line there. After a surprisingly smooth ride through the line, we turn direct to the arrival fix into MSP, and arrive 10 minutes behind schedule. Not too bad. Wonder how many more times we'll have to do that this summer... let the fun begin! The ground is wet with Type I de-ice fluid, sprayed onto our cold-soaked airplane by the ground crew before we arrived. Maybe it had frost on it, maybe they just wasted a bunch of money. Who knows. The sun is starting to rise in the east. That's cool- most of my morning pre-flights are done in the dark. The fuel gauges read 19,800lbs... just 1,000lbs shy of the max quantity of 20,785. Must be a long flight, or bad weather in MSP. Or both. We brief and setup for a Catergory II approach, the lowest our aircraft and airline are certified in doing. A couple of Radar Altimeters mounted on the underside of the tail constantly measure the distance between the ground and the aircraft. Using these, we can shoot an approach down to 100' above the ground with as little as 1200' forward visibility before we see anything. Fortunately, the RVR (Runway Visual Range) for 12L is reported as greater than 2600'... and at 200' above the ground we get the Approach Lighting System in sight, followed by the runway as we descend through 150'. 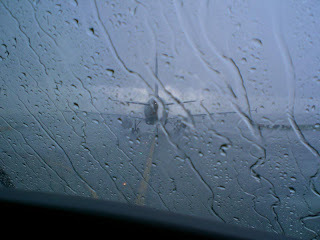 The Captain manages a smooth landing on the wet runway, pulling into the gate 15 minutes early. 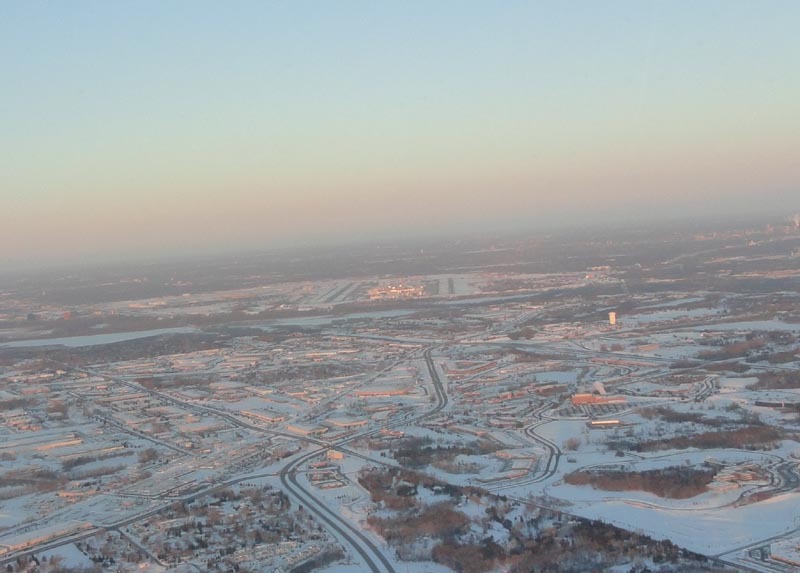 The first rays of sunshine are starting to fall on the frozen city of Minneapolis as we descend through the smooth, cold air with 76 sleepy passengers on board. It's 0815am, and I've been on duty for 13.5 hrs. 7 hours on the ground in ORF (Norfolk, VA) yielded about 5 hours in the hotel room, and maybe 4 hours of sleep... but I slept some during the day, and my plans include another nap before repeating the process again tonight. The clock reads 11:17 UTC, or 06:17 local time in ORF, or about 7 hours since blocking-in the night before. We pushed on-time seven minutes ago, but are now sitting perpendicular to another gate with our engines shut down. Norfolk operations requested that we empty the potable water tanks on descent into ORF a few hours ago, a feature this fancy little airplane has to prevent water from freezing while it remains on the ground in below freezing temps overnight. I'm baaaaack. With a new ride. And some snow. It's still snowing, and it has been for a few hours. 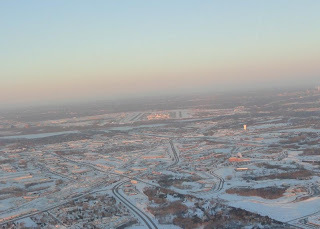 I arrived at 6:45pm to a cold plane covered in snow and ice. 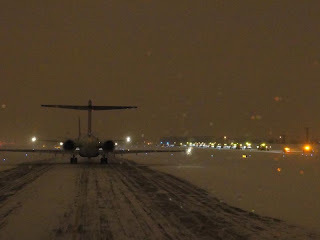 Four inches of snow covered the ground as I checked the outside of the plane for any abnormalities. No issues. We push off the gate 10 minutes early, at 7:25pm, heading to the de-ice pad next to runway 12L to get cleaned off and de-iced. Surprisingly, not much of a line ahead of us... shouldn't be too late! 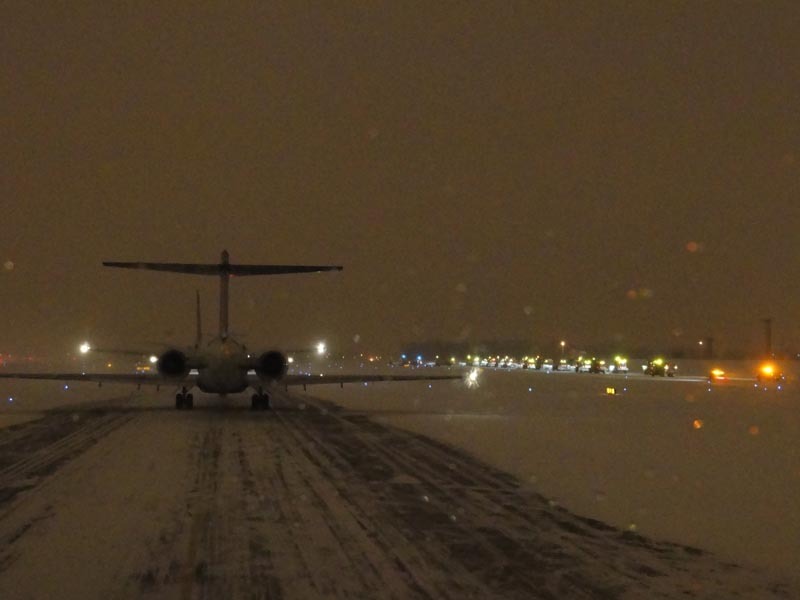 With the current temperature and precipitation level, we have 40 minutes to get to the runway and takeoff. Shouldn't be a problem, right? 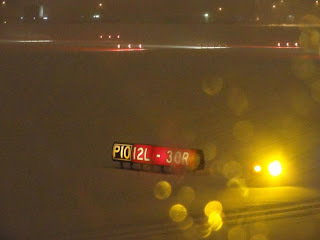 Just as we finished our checklists to taxi for takeoff, ground control advises us that 12L has just closed for snow removal. 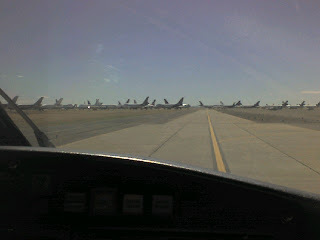 Taxi to runway 12R. Ok. No problem, we have 40 minutes. 35 minutes later... number 2 in line for 12R. Tower tells us that 12R is now closed for snow removal, taxi to 12L. (Are you kidding me?!). Us: "We have 5 minutes to be airborne, how's the line look?" Us: "Ok. We need to return to the 12L de-ice pad." 7:00am local. 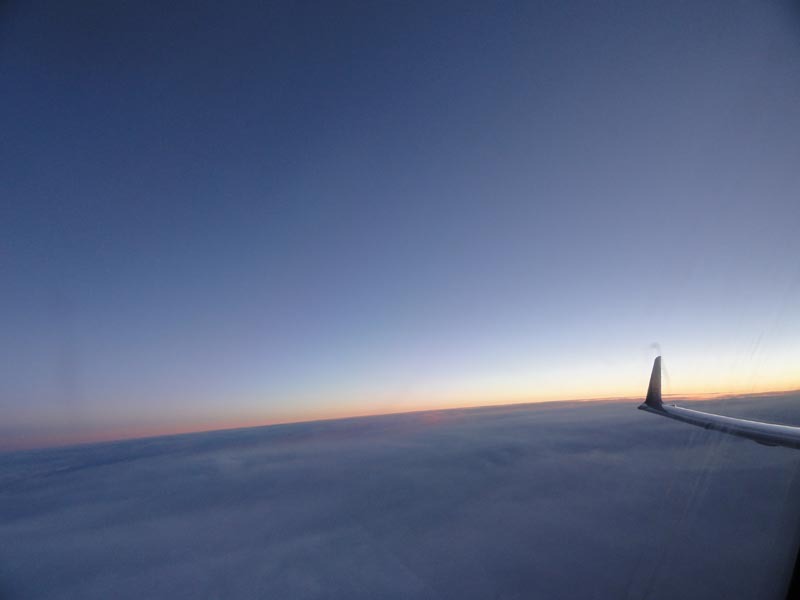 FL360. Westbound to MSP, where it is still snowing but is forecast to clear up by the time we arrive. I arrived at the airport at 5:00am for a 'ready reserve' shift, thinking I would be on my way home at 11:00am to spend the day by the pool. I was wrong. My phone rings at 5:10am, it's crew tracking. "Cameron? Looks like we've got a couple of fun days for you today and tomorrow." "Looks like we have you deadheading to Little Rock, AR at 9:40am. Then you will catch some sort of ground transportation which we are setting up, to take you to Hot Springs, AR. 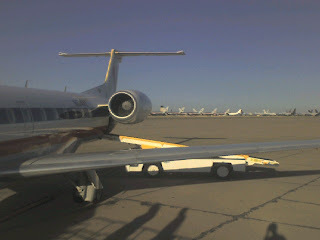 There you will test flight a CRJ-200, then repo it to Roswell, NM so it can get painted. Then we have some more ground transportation to take you to Albuqurque, NM where you will spend the night. Then tomorrow you will deadhead from ABQ to Phoenix, then to Charlotte. Questions?" Thinking to myself: Why me?! What did I do to deserve 6 hours of 'ground transportation', a 16-hour duty day and a test flight, in an airplane I haven't flown in over a year?!? 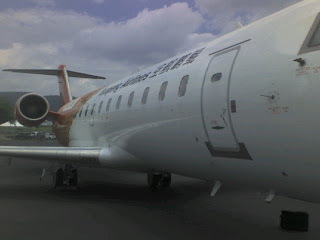 The Captain and I arrived in Little Rock, and I called a number that crew tracking provided for a charter/limo service. Minutes later, we were loading our bags into a black Chrysler 300. Not too shabby. An hour later, we arrived in Hot Springs, and after wandering around for a bit, we finally managed to find the hangar where the maintenance guys were that had finished our airplane's maintenance check. After discussing what needed to be done, we went out to check out the airplane and do a quick test flight. Turns out, it was one of the CRJ-200's that were sent to China for a brief operation, that ultimately failed. That's the only propeller on the airplane. It's called an ADG, or Air Driven Generator. 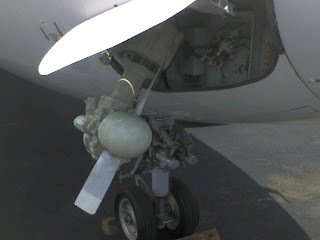 I guess it's not a propeller, as it doesn't propel the aircraft! 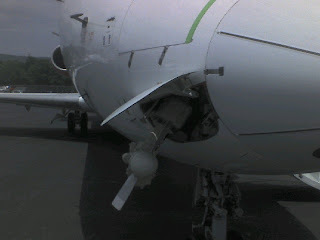 It's purpose is to pop out of the side of the aircraft if/when there is a COMPLETE electrical failure from the jet engine driven generators, AND the APU's generator. It provides electrical power for certain 'necessary' systems and screens in the flight deck. It also powers some hydraulics, again, for 'necessary' systems. Our test flight was to deploy and check the operation of the ADG. 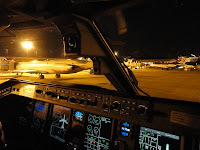 So we took off from the non-towered, quiet little airport and the Captain flew a pattern around the airport while I followed a checklist and deployed the ADG, checking all of the indications and systems to insure that it was indeed working as it should. Ops checked good, we continued around and landed so the maintenance guys could put the noisy little prop back in it's home. After a few calls to dispatch to get some paperwork and charts for our flight to Roswell, NM, we were ready to go and the mechanics were almost done with their work on the plane. There were a number of old turboprops, and even a few regional jets sitting around Hot Springs, clearly retired and most likely not to be flown again. More of the same when we arrived in Roswell. No sightings of UFO's, thankfully, and a pretty uneventful flight. The afternoon heat caused for a bumpy descent and landing in Roswell (which the Captain did well, also not having touched a -200 in many months). The dry desert climate is ideal for storage of aircraft, which may or may not fly again. 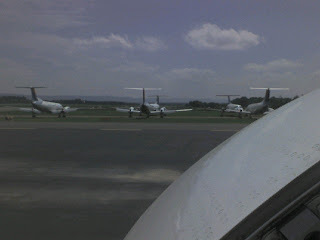 Hundreds of jets from American, UPS, United, US Airways, Southwest, etc. 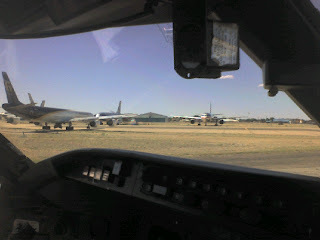 are parked in rows, ranging in size from regional jets and turboprops to 747-400's. It's a rather sad sight to see. The company never really arranged any ground transportation to ABQ (no surprise there), and we had already been on duty for over 12 hours... so they got us a room in Roswell for the night. The plan was to be driven to either ABQ or El Paso the next morning, and then deadhead to Phoenix, and ultimately back to Charlotte. 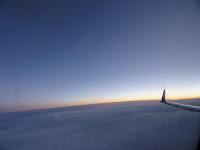 Fortunately, there is one carrier left providing service to Roswell, so the Captain and I jumped on the first American Eagle flight to Dallas/Fort Worth in the morning. There we got a deadhead to Charlotte, which wrapped up the day for me. 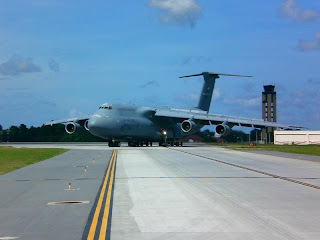 A C-5 Galaxy clearing the runway in Charleston, SC. Big plane. Kinda funny looking too. 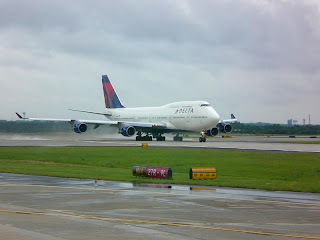 As we wait in line in Atlanta, a Northwest 747 sporting the new Delta colors begins its takeoff roll. And here we sit, in line, in Atlanta. It's summer time again, which means thunderstorms. Weather has already rolled through the ATL area, skewing the flight schedules, and making us number 25 in line for our runway of departure, even though we left the gate on time. 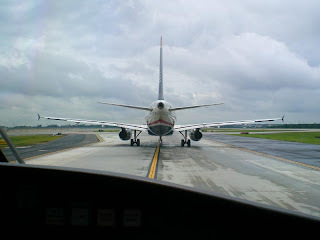 A US Airways Airbus A320 waits ahead of us, bound for Phoenix. Look similar to the last picture?? Moments before the wind picked up and the rain began blowing sideways, the sky was getting darker as a large cell approached the airfield from the west. 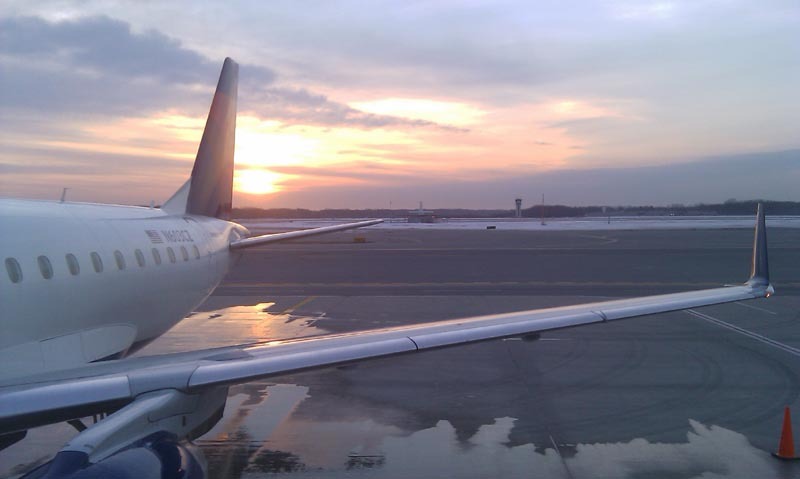 "Ladies and Gentlemen, from the flight deck: good news and bad news. Good news is, we are currently number four for departure. The bad news? Those of you on the right side of the aircraft have a pretty good view of a thunderstorm that has moved onto the airport. All departures have been stopped until the storm passes. The storm appears to be moving quickly, and as soon as it passes we will have you on your way to Charlotte as quickly and safely as possible. Appreciate your patience. Thanks."